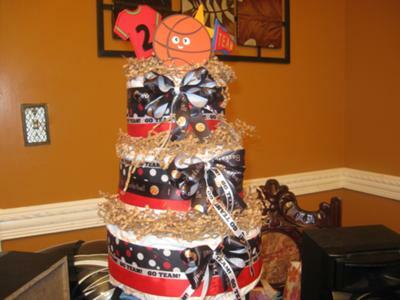 Love 4 Basketball Diaper Cake! Great theme! And delightfully decorated! 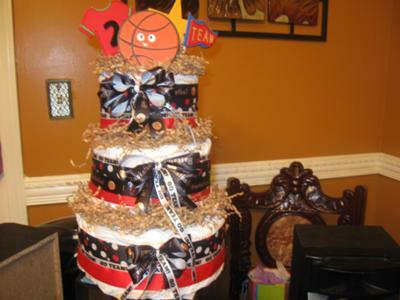 I love this basketball diaper cake, especially the cute colors and the colorful ribbon used. One of our readers in the heart of basketball country submitted her diaper cake to pay it forward with her fun diaper cake ideas. Rhonda and her cute creativity is a great source of inspiration for a sports-themed diaper cake. Rhonda is one of our many fabulous readers who share their time and talent with us by adding their diaper cake photos and comments to our huge diaper cake photo gallery. Thanks for sharing your wonderful cake Rhonda! Do you have a baby diaper cake that you would like to share with us? Send it on over to us right here and we would love to post it on our baby shower diaper cake gallery! This is one I made for a friend and everyone loved it!! Making diaper cakes is something that I'm just starting to get into. I made one last year and here is my second one and the demands are booming! Comments for Love 4 Basketball Diaper Cake! Your cake must have been the hit of the shower! Rhonda I need your number! !